I updated instead from github, which caused elefant to show a click to update button in the browser. When I clicked, I got an SQL error because MySQL doesn't like the default '' for the text field about in the user table. I just pushed a change that gets rid of the default value for about. Let me know if that fixes it. Yup, it fixed it. Thanks. Do you know what the other error (Error: Unable to fetch file. releases/1.3.json) is about? Yeah, quite a Catch 22! What I mean is that I'd probably include an EOL character if it weren't for the closing PHP tag, which I usually try to avoid having any extra characters after. So when I use closing tags, I prefer not to have an extra EOL on the chance that extra whitespace could sneak in there and mess something up. I see. As I understand it, it's not really an extra EOL character -- it's just the line feed at the end of the last line. There's not actually any white space below the closing tag. 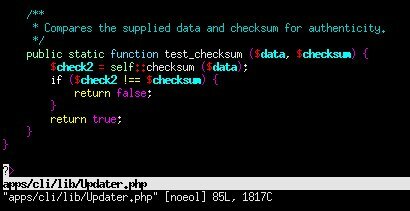 But I would take the PHP closing tag over the EOL character if I had to choose one or the other. Not hard to add about to the handler, but I mention it because I believe the default elefant user signup form also doesn't include the about field. Do you mean you'd prefer to keep the closing tags over having an EOL character at the end? If so, why is that? I'm kind of leaning towards getting rid of the closing tags in .php files at some point, since that's what the PHP manual recommends, and only haven't because I've been in the habit of including them for so long. Ah yes, the about not having a default value breaks the user/signup form. I've been using SQLite too much these days... Just added an empty about field to user/signup and user/login/newuser (for social logins). Well, I hadn't really thought about the closing tag issue, so I don't really have an opinion about that (other than a reflexive "if it's been opened, it seems good if it's closed"). The line ending thing affects me more because I use linux on my work computers and linux tools expect text files to end with an EOL. In particular, the way I update elefant is to pull the changes into a mirror on my machine and then run a script to find differences in my sites (to make sure I don't overwrite any hacks I might have made to core files). Currently, that script reports every EOL/no EOL difference as an actual change, so there's a lot of noise. I think getting rid of the closing tags and requiring the last line of all .php files to be an empty line (which is in line with the PSR standard, although I diverge from it on a few other things like tabs) should solve the noisy diff issue. I should be able to remove them all with a quick shell script. Still not sure if we're talking about the same thing because they don't display with an empty last line for me. Thanks, I'll check it out this weekend. 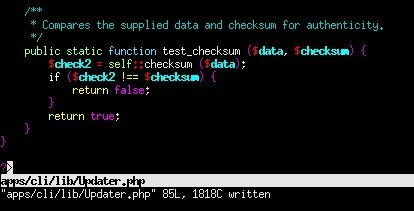 Upon further checking, the .php files in lib/vendor and the .html files in apps/cli lack EOLs. Also a couple other places, but it's much cleaner now, so thank you. Re: the github url: if we change the url in apps/cli/lib/Updater.php can we run the updater safely?